Once I had tasted asparagus that had been roasted or grilled, I was hooked on its delicious caramelized texture and never looked back. Other then enjoying them pureed in a soup or canning Pickled Asparagus for Bloody Marys, I really did not crave it any other way. However, recently while searching through some old Polish recipes, I found a simple and inexpensive way to prepare it that completely captured my curiosity. 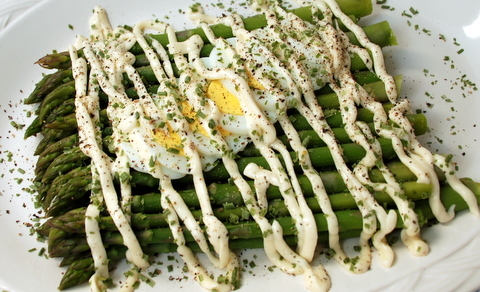 I picked up a fresh bundle of asparagus at the market this weekend for $1.99 and for less than $3.00, I made this gorgeous dish to enjoy as a light snack. The colors were bright, he flavors were crisp, and although, I am not a huge fan of hard boiled eggs, I found myself dragging them through the remnants of the dressing on my plate till there was nothing left. The pairing of flavors was so divine, that I can not wait to make this again. It is a perfect make-ahead dish that would be a welcome relief to vegetables and dip at a party. The hard-boiled eggs could easily be replaced with cocktail shrimp or do not use either and serve this as a side dish next time you make dinner. Either way, you really should try it and remember how good asparagus is when it is lightly cooked and simply prepared. Living in Florida for as long as I did, I have probably spent years of my life standing in line at the grocery store during hurricane season. There would always be a run on bread, a shortage of milk, a collective panic of people wondering what foods could be made without electricity, and lines that ran clear back to the end of the store. It was a madhouse and as I often walked away with bags full of water, juice, granola bars, trail mix, protein bars, and fruit I would wonder, other then junk food, what else you could eat? Yesterday, during The Kentucky Derby, we sipped on Mint Juleps and cheered for our horses. Today we woke up to left over Mint Julep Syrup, a few handfuls of fresh mint, a tiny bit of bourbon, and a bowl full of perfectly ripened fruit. Together they made the very best “Day After The Derby Breakfast. Fresh sliced fruit, a drizzle of Mint Julep Syrup, and a splash of bourbon tossed gently in a bowl. Plate and serve with fresh mint leaves.